A recently developed smart watch technology can detect movements indicative of a convulsive seizure in people suffering from epilepsy, and provide alerts to parents or other caregivers. The Android-compatible device uses motion-processing algorithms and smartphone connectivity to send text alerts when potential seizures strike. Epilepsy is an unpredictable disease marked by seizures that can occur virtually at any time. The disease affects up to 50 million people worldwide, according to estimates from the World Health Organization. Many people with epilepsy are treated with medication to control their seizures, and others may have a neurostimulation device implanted to prevent them. However, medications are not always effective, and surgery sometimes is not an option. In such cases, patients must be monitored closely, so a caregiver can respond quickly in the event of a seizure. This can lead to many lifestyle constraints for the patient. 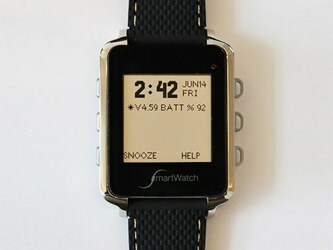 Increasing the freedom of epileptic people, while still allowing them to be connected to caregivers, is the goal behind the development of a new smart watch developed by a startup called Smart Monitor. According to a recent article from IEEE Spectrum, the SmartWatch is designed to detect shaking limbs that often accompany convulsive seizures, sending out an automatic alert to caregivers who may be nearby. Originally intended for younger patients, about 60% of smart watch users are under 21, though it is also used by adults. While the SmartWatch is designed to detect motion, it is more than just a mechanical sensor, according to the Smart Monitor website. While the user is wearing it, the watch is constantly registering patterns of motion and developing a set of baseline data. Algorithms included in its control systems are continuously running analyses on the data to identify patterns of movements that indicate a seizure is taking place. In addition, the SmartWatch has an alert button that the patient can use to manually summon a caregiver, and it can be programmed to deliver medication reminders as well. The SmartWatch pairs with the user’s Android phone (an iPhone-compatible version is expected in March), which must be close enough to interface with the device, according to the IEEE Spectrum article. If a seizure is detected, the phone sends a text alert to pre-programmed caregivers and can also provide the patient's GPS coordinates. Secure data collection and transfer is available, which enables physicians and other caregivers to monitor what happens between office visits. The SmartWatch isn’t FDA-approved to diagnose seizures, but can detect abnormal motions, Smart Monitor CEO and founder Anoo Nathan told IEEE Spectrum. The company will eventually seek FDA approval, Nathan said, and is currently collecting data in clinical trials. In the modern age of information technology, remote monitoring of health conditions and disease status is becoming increasingly important. For example, to overcome a lack of options for remote diabetes monitoring, a coalition of parents recently hacked into blood glucose monitoring devices to gain remote alerts for their children’s blood sugar levels.